Version 0.1 of the eight2empire tileset is ready to download, just click the tab at the top of the blog and bring it home! 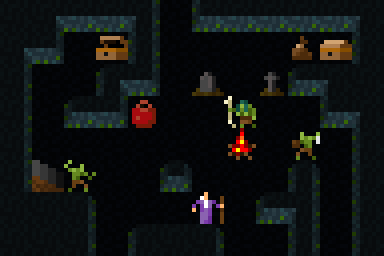 At the moment only level and monster tiles are included but I'll be adding item tiles as soon as I can. Hopefully there is enough material to get you going and keep you entertained while I work on filling out the set. As always your comments and feedback are greatly appreciated. 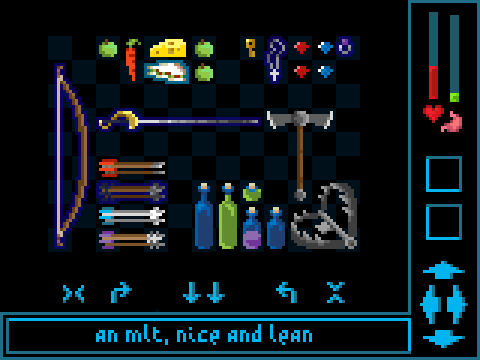 Potions and Magic often overlap heavily in games, with many spells having equivalent potions and vice versa. I think it takes away the uniqueness of magic and prefer when there is a clearer distinction between the two, in terms of effect and usage. Potions should include anything you can put in a bottle. From the everyday things like lamp oil, milk and soup to old favourites like poison, acid, hallucinogens, nerve tonics and antidotes. Their effects would always be direct and singular to an individual, lowering or raising a stat or causing a status effect like paralysis. 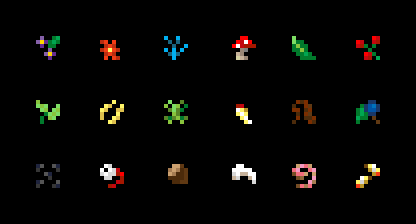 For the more exotic potions the player would need to find recipes and then collect ingredients - or purchase them directly from witch doctors or apothecaries. Potions can be held in small medium and large bottles, capable of containing 1,3 and 5 doses respectively. The advantages to smaller bottles are their use as sling ammunition and their lower chance of breaking when the player takes blunt weapon damage (Broken glass covered in poison might have its uses though). For magic I prefer the pulp fantasy variety that costs its users dearly - dabbling in dark arts should not be taken lightly, and wizards shouldn't be able to walk around throwing fire like tennis balls. Spells should be cast with ceremony - laying down arcane areas of effect like protection from beasts or auras of fear and frenzy. 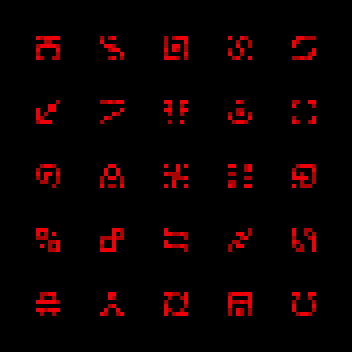 To reflect this I have made some spell tiles that are written in the players blood. Yes sir, our HP and manna are now one and the same, every spell bleeding a percentage of life force out of you. The closer you are to death the cheaper magic would become hopefully adding some strategy and drama to magic use. Thematically it might turn heavy magic users into Elrik like characters - addicted to restorative potions, stimulants and other concoctions to negate the crippling effects of their sorcery. Or perhaps the blood of innocents could be harvested for use in magic instead. 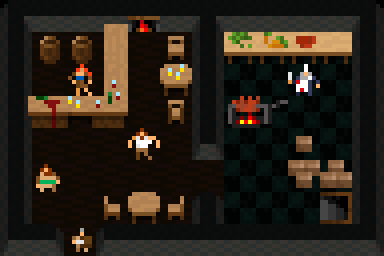 Dungeons need to be furnished to stop them from being boring empty spaces. Ideally the furniture should serve other uses besides decoration. 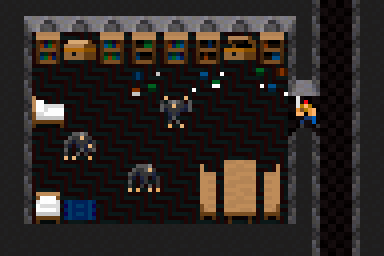 Bookshelves can be ransacked in search of spells, recipes and maps, beds can be used to rest and fires cooked over.With a limited capacity to carry equipment the cupboards need not be so bare either. A barrel could be full of apples but a sensible adventure would only take a few. These are just a few mock ups. I think furniture will be the most challenging areas of this tileset, as I want to provide lots of props to create engaging environments. 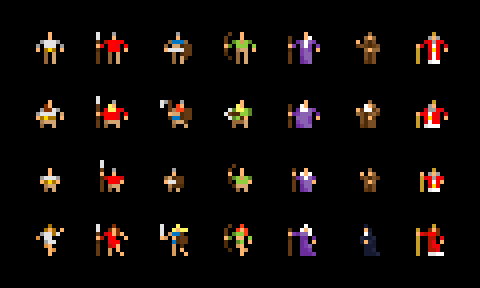 Here is a selection of wall graphics, you'll have to click the image to see them bigger (and maybe Ctrl+ a few times). I have all the shading saved as a separate layer in Photoshop, so its pretty easy to create new themes by sliding different textures underneath. I'll make some more elaborate mockups later when i'ts not 2 in the morning and my eyeballs don't feel like they are made of sand. I am doing all this on a fairly crummy laptop, so its pretty hard to judge whether I have the contrast values right, anyone out there with a calibrated CRT wanna give me a clue? 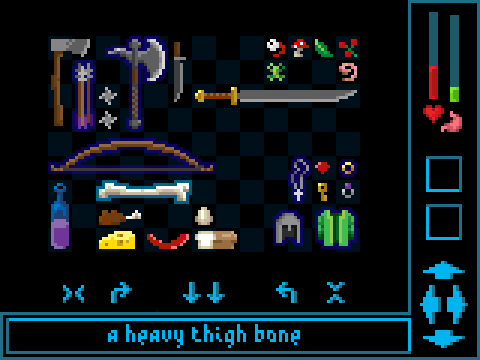 Not too much to say about these really, the goblin witch has a bone staff, the mechanic 'weldlings' have non specific weapons, maybe steam guns? It erks me in games when I can hold an unlimited amount of junk. It ruins my suspended disbelief and feels like a missed opportunity for an extra area of strategic play. Because of this I'm working on item graphics that would work with a Systemshock/Resident Evil 4 style inventory system. In RE4 95% of the tension comes from having to ration your bullets and finding room for that extra machine gun. Adding the ability to carry unlimited health or ammo would kill that game totally. Another thing I don't like in games is grind, I don't have time for it and sometimes it can feel very artificial, especially when there are arbitrary level requirements set to use seemingly ordinary items like capes or shoes. In my ideal game success would depend on resource management and selecting the right equipment. Making sure you have enough food and light before you plunge into the mysterious depths and knowing you have the best weapons to vanquish your enemies should be of prime concern. 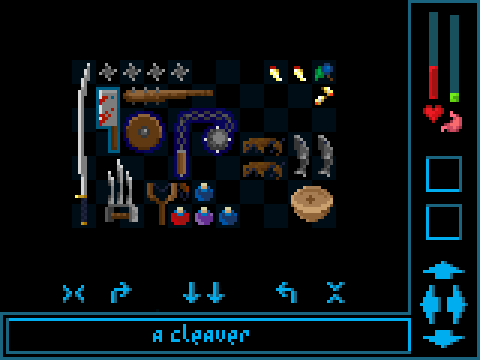 I think having the items depicted at a larger and more detailed scale compared to the gameplay sprites adds a nice level of obsessiveness to the inventory screen, after all its all about the loot. In addition to damage stats for weapons I would like to see Quality and Condition levels. The better quality the item the slower its condition degrades and longer it takes to break. This would hopefully disrupt the pattern of finding better equipment and dumping your old stuff without ever looking back. A trusty blade of medium damage might be preferable to a razor-sharp goblin scimitar that would quickly loose its edge. conversely, rather than use your fine war mace for smashing down a barricaded door, you would be encouraged to pick up an enemies crude hammer. Finding a broken sword of fantastic workmanship would require you to carry it to the surface for repair (at the expense of that heavy bag of coin), before it can be wielded. 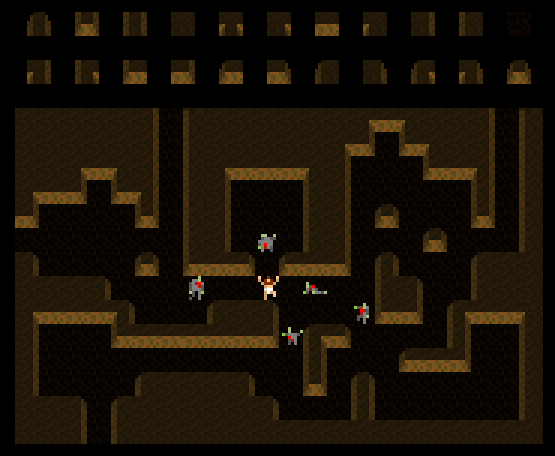 This is the tile system I have worked out for dungeons - 22 including open floor. I am a bit concerned that it might make the level generation algorithms too complicated, but I don't know enough about programming to say for sure. Once I have made a nice themed set with alt wall tiles, furniture, light sources and the whole lot has been rendered with line of sight it should look pretty special. So...who's up for a little Programming? While making these I was also reminded of something I read (perhaps by Larry Niven) suggesting that Neanderthals are the original source of Trolls in folk lore. I really like ideas like that, and near wet myself when they discovered Homo floresiensis. bear, bear, wolf, wolf, lion, lion, lion. Ill admit some are better than others, but I think they work out quite consistently in style and sizing. 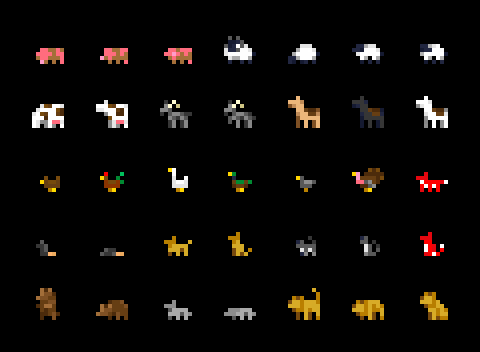 They should add a fair bit of flavour to overworld settings - little hobbit peasants herding geese, bears in caves, foxes going after chickens.